We have a dedicated team of highly skilled operatives with extensive installation and synthetic turf maintenance expertise, employed directly by PST Sport. We use specialist maintenance equipment to get the best results and have carried out 100’s of maintenance projects spanning all corners of Ireland. Our maintenance equipment penetrates the surface to decompact infill, which is then evenly distributed. The carpet fibres are lifted upright to enhance playing characteristics and ensure safe and consistent play. The frequency of maintenance will depend on a number of factors including the type of sport being played and the intensity of use. HOW DOES OUR 8-STEP MAINTENANCE PROCESS WORK? On arrival our maintenance operatives will assess the artificial grass surface by measuring infill, checking seams and lines around the pitch. We apply our Multigroomer to the surface over the entire area. The Multigroomer which is designed specifically for decompacting areas of heavy use decompacts the infill using its tines. The rear drag brush on our Multigroomer redistributes and levels the infill following decompaction. We then use the brushes on our Multigroomer to encourage the grass fibres to return to an upright position. We apply our oscillating brush to the surface which works the infill back into the fibres ensuring the surface looks fresh and feels soft underfoot. We then re-measure the infill levels. There is usually an increase of as much as 10-15mm. This is dependent on the condition of the artificial grass surface prior to maintenance. We check all lines and seams again for failures and repair if necessary. On completion we provide the client with a detailed maintenance report on what has been carried out by our PST Sport Maintenance Team. We will also advise on what needs to be done regularly to keep the astro turf surface in the best possible condition. Regular maintenance ensures the surface lasts longer and plays better, helping you avoid any expensive repair costs. Contact us today to discuss your pitch maintenance. Call us on LoCall: 1890 253 353 or Email: info@PSTsport.com. Alternatively click HERE to get in touch. 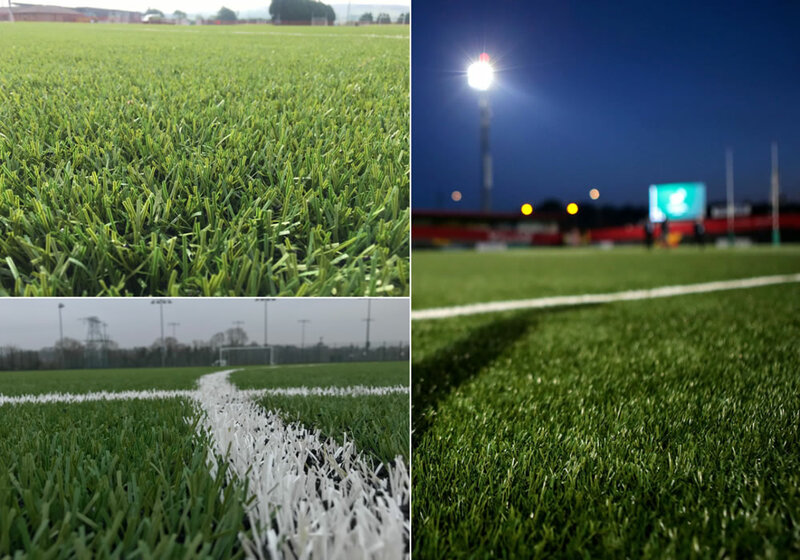 (Top left) 14,400 sq/m multi-use synthetic turf pitch at Owenbeg Complex in Derry after maintenance in 2018; (Right) maintenance of our full-size 3G pitch at Munster Rugby’s Cork base, Irish Independent Park in advance of Ireland’s Six Nations victory over England on Friday, February 1st, 2019; (Bottom left) 7,000 sq/m 3G pitch at Beckett Park post maintenance.